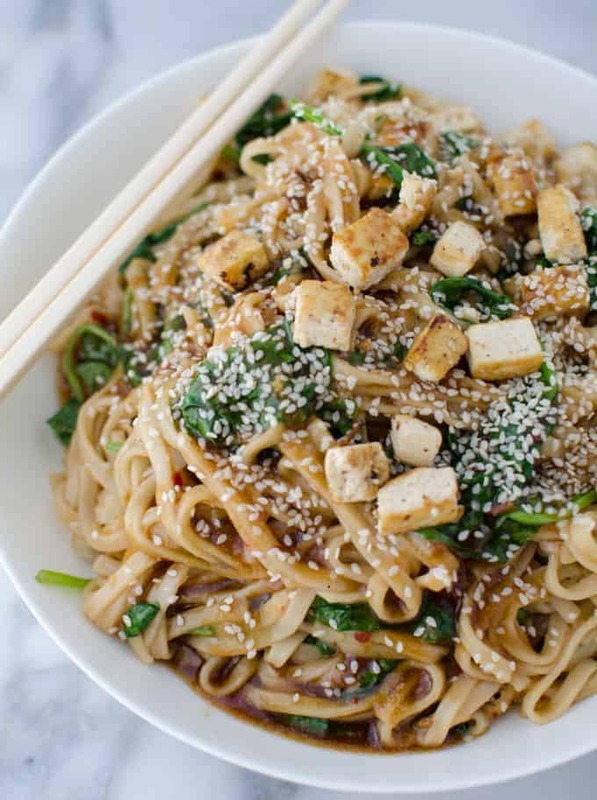 Sesame Garlic Noodles! Udon noodles tossed with a gingery-garlic sauce and faux-fried tofu. Grab the chopsticks! How do I even begin to describe the deliciousness of these stir fry noodles? Quick sesame ginger stir fry sauce (healthier & much more flavorful than jarred stuff) stir fried with udon noodles, lightly fried tofu and spinach. See BL, your wish is my command. You asked for more stir-fry, and you got it. Of course, you got stir fry NOODLES because I still had to get my pasta fix, and I will always choose slurpy, sauce-coated noodles over rice. Every time. I haven’t even told you the best part! These stir fry noodles take less than 30 minutes to make from start to finish. Press the tofu (more below), boil the water, make the sauce. Once everything is prepped, the entire dish is ready in less time than it takes to check your current facebook feed. Which, as we transition into the Fall Semester, is exactly what I need. Healthy dinners that I can whip up (and my husband can clean up) in the time it takes me to catch up on True Blood. It also leaves me enough time to enjoy my evening and quality time with B. To start, you’re going to need to press the tofu. This is one of those things that no one really talks about when it comes to tofu prep, but it is ESSENTIAL. Pressing tofu gets rid of extra moisture —-> needed for crispy, not-soggy cubes. Pressing also allows your tofu to soak up the flavor of whatever sauce you are using. A double shot of flavor in every bite! Since I hate cleaning extra plates, I just use my heavy-duty cast iron to press the tofu. 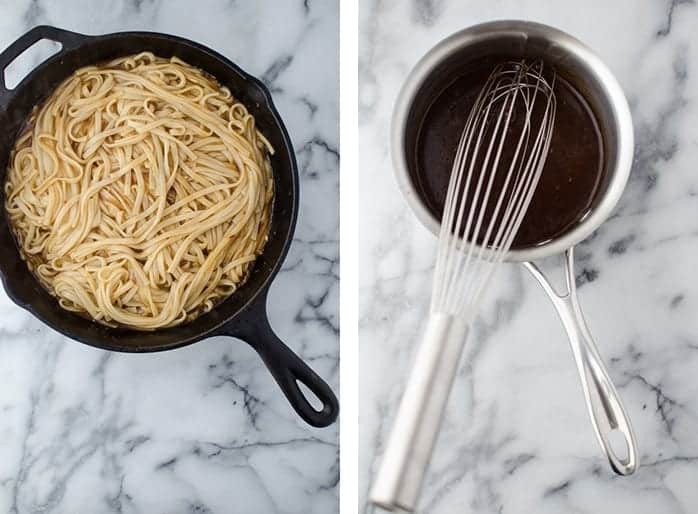 My cast-iron pan is my go-to pan for just about everything in life. Even though my cookware tops the $1000 range (please send help), I often find myself picking up my $30 cast-iron pan over and over again. Ironic, no? 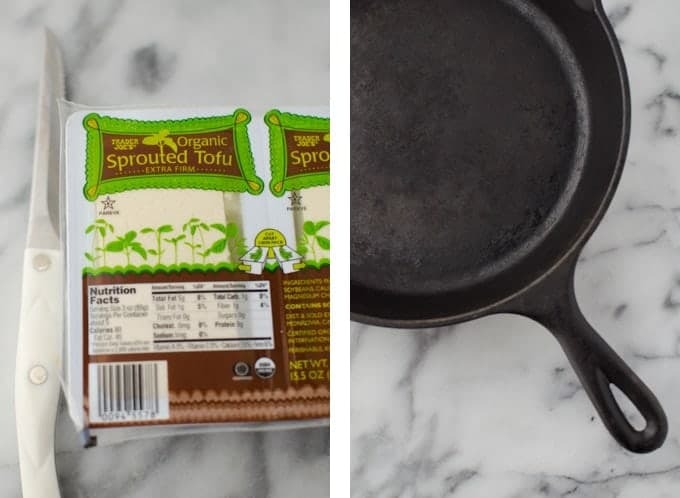 It’s my favorite pan and the best for crispy tofu! Remove the tofu from package and give it a quick rinse. Wrap tofu in-between a few layers of paper towels and place on a cutting board (or plate if you want to get fancy). Place a heavy pan on top and let sit for 5-10 minutes until most of the water is pressed out. Gently pat tofu dry and cut into cubes. Now, we can fry! This stir-fry sauce is an old favorite, one I tweak from recipe to recipe depending on what kind of mood I’m in. To me, it’s the perfect combination of the best stir-fry flavors: sesame, ginger, and garlic. I like a little heat to balance the ginger so I added a generous tsp. of red pepper flakes. Add more or less to your liking. Make the sauce while the udon noodles are cooking. I LOVE udon noodles and always have the same thought while I am making them — why don’t I make these more often? They really hold up to a thick stir-fry sauce like this one. I add spinach, for both color and nutrients but I think any vegetable would taste great here. Swiss chard, I’m coming for you in this dish next! If you are using a heartier vegetable, add it to the skillet before you add the noodles so they have more time to soften. Yeah, it’s as good as it looks. If you make it- let me know! I love seeing your photos and hearing about your customizations. 8 oz. tofu, drained and pressed then cut into cubes. Bring a pot of boiled water to a boil. Add the noodles and cook for 2 minutes until soft but slightly undercooked. Drain and rinse with cold water (this will stop the cooking process). Whisk together the corn starch slurry, vegetable broth, soy sauce, rice wine vinegar and sesame oil. Place in a small pot and bring the sauce to a boil. Reduce the heat to low and simmer, adding the ginger, garlic and red pepper flakes. Cook on low until thick and reduced. Add the diced tofu and stir fry until golden brown on all sides. Add 2 tbsp. of sauce and quickly cover the tofu, taking care not to break the cubes. Add the cooked and drained noodles along with the spinach and sauce. Stir fry for a few minutes until hot. If the sauce becomes too thick, add a tbsp. or two of water. 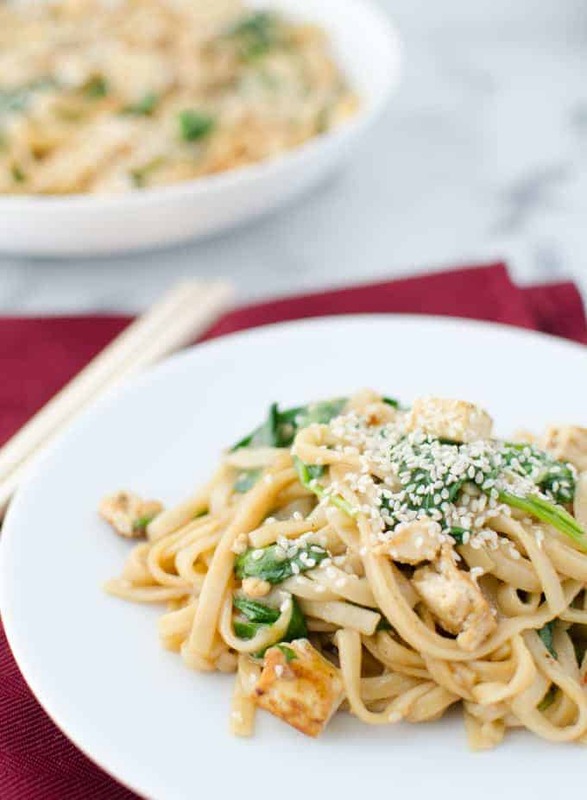 Toss the noodle mixture with the tofu and serve with sesame seeds. Gorgeous photos! Looks SO delicious. 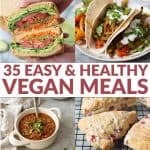 Pinned to my veg-friendly board! Hi Elie, this serves 4. Thanks! Love all of these flavors. I need a go to stir fry sauce so thanks for the recipe. Can’t wait to try it! YUM!! I really need to get a cast iron pan. I still can’t believe I don’t have one yet! Ohhhhh, these sound so good right now. I love udon noodles, and garlic ones?! Heck yes! So saucy and scrumptious, you’re so smart. Now I reallllly want some udon noodles! Do you use the wet or dry ones? I really need to get a cast iron pan, I have a small Le Creuset enameled one, but it’s not very big. I use the dry ones and I have to limit how often I buy them because they are sooooo good! I just use a inexpensive cast iron pan and it’s my favorite! This sounds wonderful! I can use all the carbs I can get to fuel my 80 miles a week right now. I love the simplicity, yet interesting combination here! Yum! You don’t need to worry about describing how delicious these noodles are- The photos speak for themselves! That looks like one knock-out recipe. I used your sauce recipe in an udon noodle stir fry with onion, broccoli, capsicum, mushrooms and bok choy and it was so delicious! Did you use the regular firm tofu? Why is this called garlic noodles if there is 3 Tablespoons of ginger and only one garlic? Not a criticism, I was just surprised at how much ginger the recipe called for (especially versus garlic). 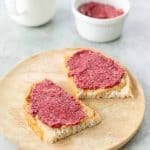 Do you really use that much ginger? Hi Caitlin- good point!? Yes, I really use that much ginger but you can use as much garlic as you want! And, if you aren’t a huge fan of ginger, then feel free to cut back. I am finding tofu is much better without cooking in oil. Dry fry in a cast iron pan, slowly, not high heat. Hi Cate! Totally agree- I LOVE dry frying it or baking it in the oven without oil. If you don’t have a cast iron though, oil helps! Hi this looks amazing but I have a wheat allergy—do you think rice noodles would work as a sub? Thanks! I don’t see why not? I would also try a gluten-free pasta; I love the lentil pastas or brown rice-quinoa pasta options.